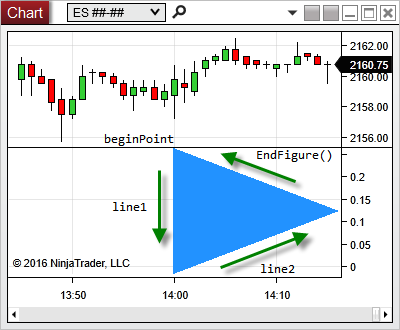 NinjaTrader Chart objects (such as Indicators, Strategies, DrawingTools, ChartStyles) implement an OnRender() method aimed to render custom lines, shapes, and text to the chart. To achieve the level of performance required to keep up with market data events, NinjaTrader uses a 3rd-party open-source .NET library named SharpDX. This 3rd party library provides a C# wrapper for the powerful Microsoft DirectX API used for graphics processing and known for its hardware-accelerated performance, including 2D vector and text layout graphics used for NinjaTrader Chart Rendering. The SharpDX/DirectX library is extensive, although NinjaTrader only uses a handful of namespaces and classes, which are documented as a guide in this reference. In addition to this educational resource, we have also compiled a more focused collection of SharpDX SDK Reference resources to help you learn the SharpDX concepts used in NinjaTrader Chart Rendering. 2.Although not entirely identical, the SharpDX wrapper is designed to resemble System.Drawing namespace; experienced GDI developers will be familiar with concepts discussed in this section. 3.Microsoft provides various DirectX Programming Guides aimed to educate users with the underlying C++ DirectX API. While SharpDX (C#) syntax is different, you may find these guides helpful for understanding SharpDX concepts not offered by this guide. Contains basic objects used by SharpDX. Contains objects used for rendering for 2D geometry, bitmaps, and text. The rest of this page will help you navigate the fundamental concepts needed to achieve custom rendering to your charts. If you simply used a vector with static values, your Vector2 objects would never change, and your drawing would remain fixed on a particular area of the chart (which may be desired). However, since NinjaTrader charts are dynamic and responded to various market data updates, scroll, resize, and scale operations - you also need a way to recalculate vectors to display information dynamically. 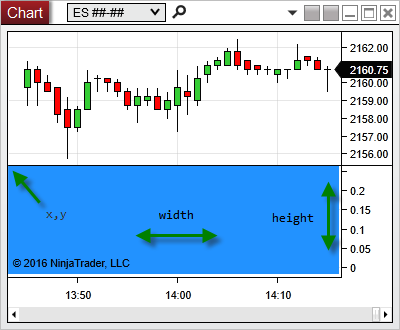 To assist in this process, NinjaTrader provides some GUI related utilities to help navigate the chart and calculate values for your custom rendering. Note: For full absolute device coordinates always use ChartPanel X, Y, W, H values. ChartScale and ChartControl properties return WPF units, so they can be drastically different depending on DPI of the user's display. You can learn about Working with Pixel Coordinates on another topic. To color or "paint" an area of the chart, you must define custom resources which describe how you wish the custom render to appear. SharpDX contains special resources modeled after the familiar WPF Brushes. However, the two objects are different in the way they are constructed and also in how they are managed after they are used. Paints an area with a solid color. Paints an area with a radial gradient. Paints an area with a linear gradient. Note: Unlike their WPF counterparts, SharpDX brushes are thread-safe and do NOT need to be frozen. SharpDX Brushes are device-dependent resources, which means they can only be used with the device (i.e., RenderTarget) which created them. In practice, this mean you should ONLY create your SharpDX brushes during the chart object's OnRender() or OnRenderTargetChanged() methods. Warning: Failure to create device-dependent resources during the OnRender() or OnRenderTargetChanged() can lead to a host of issues including memory and application corruption which can negatively impact the stability of NinjaTrader. Please be careful your SharpDX device-dependent resources are only created and updated during either of these two run-time methods. Please see the Best Practices for SharpDX Resources section on this page for more information. Note: If you are using a large number of brushes, and are not tied to WPF resources, you should favor creating the SharpDX Brush directly since the ToDxBrush() method can lead to performance issues if called too frequently during a single render pass. Please see the Best Practices for SharpDX Resources section on this page for more information. A SharpDX Render Target is a general purpose object resource used for receiving and executing drawing commands. 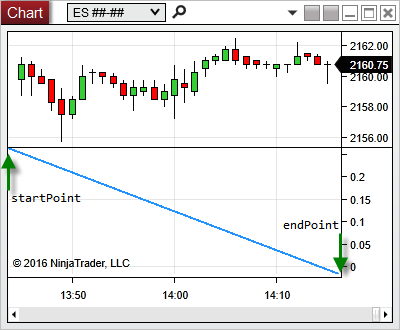 When using a NinjaTrader chart object, a pre-constructed Chart RenderTarget object is available for you to use and ready to receive commands. You can think of the RenderTarget as the device context you are using to render to (i.e. the Chart Panel). While there is nothing special you need to do to setup this resource, it is important to understand some details regarding the RenderTarget to learn how it can be used. In the above example, this order of operations would result in the second RenderTarget.DrawLine() to be rendered "on top" of the first RenderTarget.DrawLine(). If you instead called these two methods in reverse order, you would not see the thinner line since it would be covered up by the thicker line. Note: It is important to realize that RenderTarget sequencing and the Chart Object ZOrder are two different concepts. The ZOrder property controls the overall layer your entire chart object appears relative to other chart objects existing on the same chart. RenderTarget sequencing only affects the order objects are rendered relative itself. Therefore, it is not possible to sequence your chart object's RenderTarget to draw on two different ZOrders (e.g., one line above chart bars and another line below). Throughout the lifetime of a chart, the render target is created and destroyed several times to satisfy various user commands. As a result, any resources that are created need to be recreated and destroyed as that render target is updated. The NinjaTrader OnRenderTargetChange() method was designed to help with this process and will be called anytime the RenderTarget has changed. You should use this method if you have objects which are passed around from various other resources. All drawings consistent of a few basic shapes which can be called through a handful of RenderTarget commands. "Draw..." methods create just the outline of the shape, and "Fill..." will paint the interior of the shape. Draws the outline of the specified ellipse using the specified stroke style. Draws the outline of the specified geometry using the specified stroke style. Draws a line between the specified points. Draws the outline of a rectangle that has the specified dimensions and stroke style. Paints the interior of the specified ellipse. Paints the interior of the specified geometry. Paints the interior of the specified rectangle. Note: AntialiasMode.PerPrimitive allows for graphics to render more sharply, but comes at a performance cost. It is recommended to set the RenderTarget.AntialiasMode back to the default AntialiasMode.Aliased after you finish your RenderTarget Draw command. Please see the Best Practices for SharpDX Resources section on this page for more information. Using either the RenderTarget.FillRectangle() or RenderTarget.DrawRectangle() requires a SharpDX.RectangleF structure, constructed using four values to represent the location (x, y) and size (width, height) of the rectangle to draw. For more complicated shapes, you can use the RenderTarget.FillGeometry() or RenderTarget.DrawGeometry() methods using a Direct2D1.PathGeometry object, which is ultimately defined by a Direct2D1.GeometrySink interface. Warning: Any SharpDX PathGeometry object used in your development must be disposed of after they have been used. NinjaTrader is NOT guaranteed to dispose of these resources for you! Please see the Best Practices for SharpDX Resources section on this page for more information. To describe a PathGeometry object's path, use the object's PathGeometry.Open() method to retrieve an GeometrySink. Then, use the GeometrySink to populate the geometry with figures and segments. To create a figure, call the GeometrySink.BeginFigure() method, specify the figure's start point, and then use its Add methods (such as GeometrySink.AddLine()) to add segments. When you are finished adding segments, call the GeometrySink.EndFigure() method. You can repeat this sequence to create additional figures. When you are finished creating figures, call the GeometrySink.Close() method. Tip: For more examples of using Shapes for custom rendering, many of the DrawingTools included in the NinjaTrader.Custom project use these types of SharpDX objects and methods extensively. Up until this point, we have been using the SharpDX.Direct2D1 namespace to render shapes. When dealing with text, there is a separate SharpDX.DirectWrite namespace which works along with the Direct2D1 objects. There are two principle objects used for text rendering: A TextFormat object which sets the style of the text, and a TextLayout object used to construct complex texts with various settings and provides metrics for measuring the shape the formatted text. Each one of these objects has their own RenderTarget methods: RenderTarget.DrawText() for simple TextFormat objects and RenderTarget.DrawTextLayout() for more advanced layouts. Both methods accept a TextFormat object; DrawTextLayout is more complicated but has better performance since it reuses the same text layout which does not need to be recalculated. Tip: Both the TextFormat and TextLayout objects require a DirectWrite factory during construction. 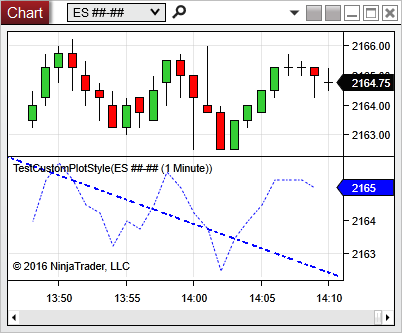 For convenience, you can simply use the pre-built NinjaTrader.Core.Globals.DirectWriteFactory property. The TextFormat object determines the font size, style and family, among other properties. Warning: Any SharpDX TextFormat object used in your development must be disposed of after they have been used. NinjaTrader is NOT guaranteed to dispose of these resources for you! Please see the Best Practices for SharpDX Resources section on this page for more information. Once the text formatting has been described, you can use this object to immediately start rendering text in the DrawText() method. This approach also requires a SharpDX.RectangleF to help determine the size and position the text renders on the chart. One common approach to text formatting is to use the same formats as existing chart objects. This provides familiar text format matching other objects which exist on the chart. 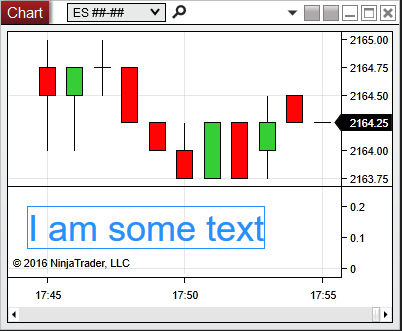 To accomplish this, you can simply use the ChartControl NinjaTrader.Gui.SimpleFont object and convert to SharpDX using the ToDirectWriteTextFormat() method. The TextLayout object works in combination with the TextFormat object by extending its functionality and providing an interface more powerful than a simple Rectangle, enabling you to position, measure, or clip the text to a surrounding shape. After the text has its format and layout, you can use the RenderTarget.DrawTextLayout() method to specify the exact location as a Vector2, as well as the Brush used to draw the text. Note: The TextLayout.Metrics height and width properties return the text pixel height, including the line spacing of the font. Due to the nature of most font families, there will be an amount of line spacing above and below the text. You can use the TextLayout.GetLineMetrics() method to help calculate the distance from the top of the text line to its baseline. When rendering SharpDX Lines and Shapes, you can optionally configure a SharpDX.Direct2D1.StrokeStyle allowing you to utilize several pre-made dash styles, or even create a custom dash pattern. Note: Unlike other SharpDX objects such as brushes, the StrokeStyle is a device-independent resource. This means you only need to create the object once throughout the lifetime of the script. However, the StrokeStyle needs to be disposed of when the script is terminated. The Creating a Custom DashStyle example below shows how to use a stroke style from the beginning to end of the lifetime of your script. Please see the Best Practices for SharpDX Resources section on this page for more information. Once you have your desired stroke style properties, you can create a new stroke style object. Warning: Any SharpDX StrokeStyle object used in your development must be disposed of after they have been used. NinjaTrader is NOT guaranteed to dispose of these resources for you! Please see the Best Practices for SharpDX Resources section on this page for more information. Tip: The SharpDX.Direct2D1.StrokeStyle require a Direct2D1 factory during construction. For convenience, you can simply use the pre-built NinjaTrader.Core.Globals.D2DFactory property. By setting the StrokeStyle.DashStyle property to "Custom", you can further refine the appearance of a SharpDX rendered line or shape by describing the length and space between the lines. Creating a custom DashStyle is not only useful for using RenderTarget methods, but also can be used for customizing the appearance of standard NinjaScript Plots. The code example creates a single StrokeStyle object using custom dash style properties. 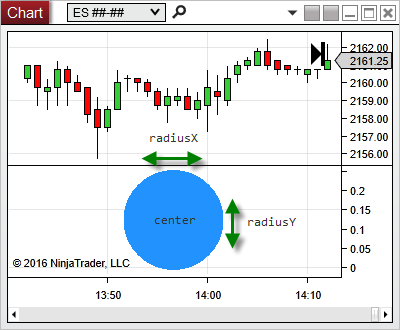 The example then uses those the custom stroke style object with user defined dashes for overriding the default NinjaTrader plot appearances, and using the same stroke style in a RenderTarget.DrawLine() command. When device-dependent resources are created, system resources are dedicated to that object. Resources which are device-dependent are associated with a particular RenderTarget device and are only available on that device. Therefore, objects which were created using a RenderTarget can only be used by that device. As the RenderTarget updates, objects which were previously created will no longer be compatible and can lead to errors. You can use the NinjaTrader OnRenderTargetChange() method to detect when the render target has updated and gives you an opportunity to recreate resources. Although most C# objects stored in memory are handled by the operating system, there are a few SharpDX resources which are not managed. 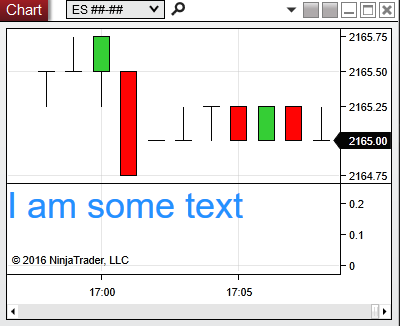 It is important to take care of these resources during the lifetime of your script as there is no guarantee that NinjaTrader will be able to dispose of these unmanaged references for you. Warning: The list above is NOT exhaustive and there are other less common SharpDX objects that could implement DisposeBase. Failure to clean up these resources WILL result in NinjaTrader using more memory than necessary and may expose potential "memory leaks" coming from your script. If you experience unusual amounts of memory being utilized over time, an unmanaged SharpDX resource is often times the culprit. Since there is no guarantee that NinjaTrader will release objects from memory when your script is terminated, it is best to protect these resources from issues and call Dispose() as soon as possible. This commonly involves calling Dispose() at the end of OnRender(),or during OnRenderTargetChanged() when dealing with device- dependent resources such as brush. Device-independent resources can be created once and then retained for the life of your application. Note: If your resource is setup (i.e., uses the "new" keyword) during OnRender() or OnRenderTargetChange(), calling .Dispose() during State.Terminated will ONLY dispose of the very last reference in memory and is NOT sufficient to completely manage all instances created during the lifetime of your script. You should be diligent in calling Dispose() throughout the lifetime of the script. Critical: Attempting to use an object which has already been disposed can lead to memory corruption that NinjaTrader may not be able to recover. Attempts to use an object in this manner can result in an error similar to: Error on calling 'OnRender' method on bar 0: Attempted to read or write protected memory. This is often an indication that other memory is corrupt. // do NOT convert an object as it is passed to an argument. // You may have no chance to Dispose of the object! If possible, you should avoid using the ToDxBrush() method if it is not necessary. It is relatively harmless to use this approach for a few brushes, but can introduce performance issues if used too liberally. Rendering with anti-aliasing disabled can be used to render a higher qualify shapes but comes as a performance impact. You should make sure to set this render target property back to its default when you are finished with a render routine.